Did you know that Logo Products have the lowest cost per impression? Put them up against any other advertising media and you will see that promo products win every time. No wonder why they are so popular and they have so many benefits. The lowest cost per impression (CPI) for promo gifts is about $0.002 and on average is $0.004. That’s way less than a penny! 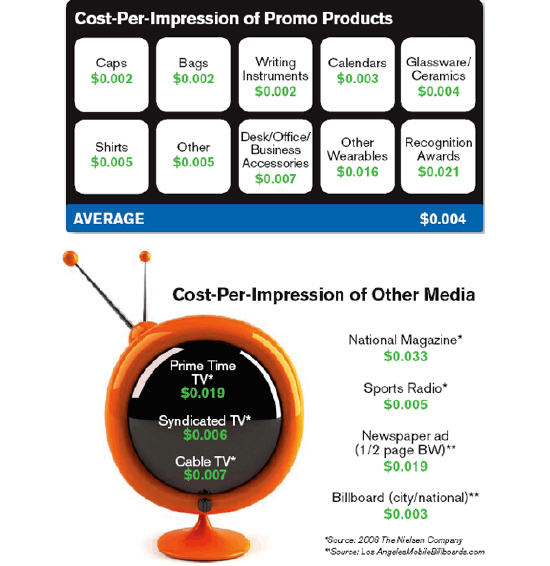 Here is how promotional products compare to other ad media. Prime Time TV: $0.019, National Magazine: $0.033, Sports Radio: $0.005, Newspaper: $0.019, and Billboard: $0.003. The most popular promotional logo giveaways are t-shirts, pens, caps and calendars. Not only do promo gifts make an impression the first time the user receives the giveaway, but the idea is reinforced every time the product is used! No other form of advertising can do that! Information provided by the Advertising Specialties Institute. Promotional products are bring your valuable brand impressions at an inexpensive price, and that’s a fact. There’s nothing wrong with dedicating dollars to television advertisements or social media promotions; actually, diversity should play a part in any successful marketing campaign.